“Tamil fishermen pose the biggest threat to our livelihood,” said M. Lingarajan, a Sri Lankan Tamil fisherman based in Jaffna, on Wednesday. “And that is the irony. We are battling our own brothers,” he said, staring emptily at the shore just a few metres away. His is among the seldom-heard voices from this side of Palk Strait. Wedded to the waters since his childhood, Lingarajan knows no other job. After a disastrous season of losses, he has barely begun to see some income, thanks to the 45-day ban observed by India that commenced on April 15. The ban prohibits Indian fisherfolk from venturing into the seas for the period, in order to allow fish to breed and hatch. After a 30-year war that shattered the country, fishermen of Sri Lanka — who were displaced to areas far from the sea — are just about getting back to business. Using rather small boats, they fish along the coast and make ends meet. “We try signalling using our torches, but they come really close to our boats. We even spoke to them, but there has been no change in their attitude. After all, it is a livelihood issue for all of us, shouldn’t they understand?” said K. Kamaladasan, whose net was damaged recently. To repair a damaged net means spending Rs.1,000 (Sri Lankan currency) per day. And usually a badly damaged net would require at least five to six days’ mending work before it can be reused, say fishermen. “If you come early in the morning, you can actually see the Indian trawlers very close to our shore. 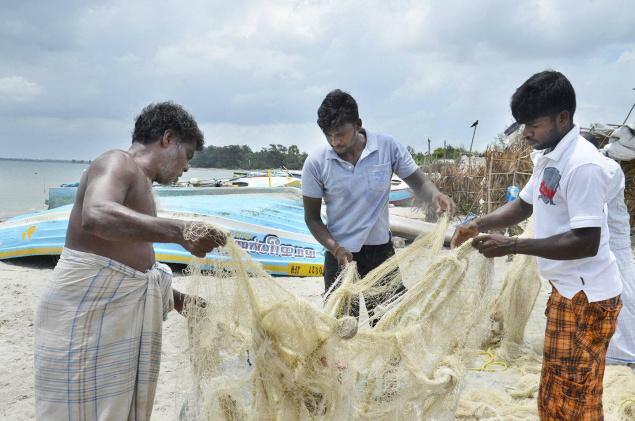 Our nets get entangled and torn, and we cannot get back to the sea for days,” said K. Rajachandran, president of Ambal Fishermen's Cooperative Society. Heaps of fishing nets torn at several places are folded and kept in a shed not far away. In addition to the tangles and gaping holes, the nets also bear hopes of nearly 300 fishermen of Karainagar — about 20 km from Jaffna. For U. Arulanandan, Tamil Nadu-based fisher folk activist, has promised 25,000 Sri Lankan rupees as compensation for the damage. The Central Government is also trying to organise talks between fishermen in both countries sometime next month, he said. Though similar talks held in 2010 and 2011 proved futile, many fishermen here are pinning their hopes on such a dialogue. “Otherwise, we are helpless. We do not know deep-sea fishing. We do not own trawlers or big boats and our nets are also smaller than those used by the Indian fishermen,” said Rajachandran, whose association has about 300 members from Karainagar, all Sri Lankan Tamils. Dialogue would enable a “bottom-up” approach to arriving at a long-term solution, said A. Jesudasan, National Coordinator, National Fisheries Solidarity Movement, which has nearly 12,000 fishermen as members from the Sinhalese, Tamil and Muslim communities. “Talks held by politicians in air-conditioned rooms alone will take us nowhere. They have to take into account our point of view. With our opinion as an input, the two governments should later hold discussions and arrive at a good solution,” he suggested. According to the fishermen in Jaffna, their counterparts from India came charging in trawlers on some days, or used large motorised boats. The problem came in another form too — the big nets used by the Indians. “Our nets are relatively fragile. If they get caught in the trawler area, or in their nets, they get torn or entangled,” said Kamalanathan. Moreover, the closer the Indian fishermen came to this shore, the lesser the catch for the Sri Lankan fishermen. Fishermen from Tamil Nadu are frequently in the news for being caught by the Sri Lankan Navy for crossing the International Maritime Boundary Line (IMBL) and engaging in fishing activity. A group of 30 such fishermen, from Rameswaram, was released by the Sri Lankan authorities on Wednesday. While politicians and activists in Tamil Nadu are quick to back their case, no one considered the plight of fishermen in Sri Lanka, say Jaffna fishermen. A few of them also observed that they had little faith in politicians. “Some of the Tamil politicians here feel grateful to Tamil Nadu for their support to the cause of the Sri Lankan Tamils, and never take up our issue with them,” said an elderly fisherman.